Take a tour on some of the beaches of our region, Messinia! Look around in each section with the help of your pointer. A long beach with sand and pebbles. The Methoni beach stretches along the bay and of course below the castle. Stomio is a beautiful bay with crystal clear waters and pebbles, located in Filiatra region and is one of the most beautiful beaches of Messinia. Kalamata beach has a coastline of 3 kilometers and certainly impresses for its water since many of its sections have been awarded with the “Blue Flag”, the best-known environmental quality label in the world. It is probably the most famous beach in Messinia, and definitely one of the most beautiful and special beaches in Greece! It is a natural creek of rare and unique beauty that stands out for its fine white sand and crystal clear, turquoise waters. It is within the protected zone of the European network Natura 2000. 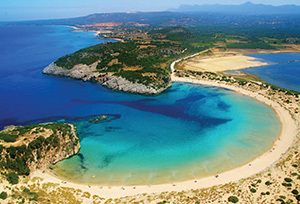 The Bouka beach is considered one of the largest and most organized beache of Messinia. It has a large area of fine sand and there is a also a beach bar, beach volley courts and other infrastructure. It is located in the center of the closed Messinian Gulf which ensures turquoise, warm, calm waters and has acquired a “blue flag”.